You will be welcomed by your driver / guide from Kigali international airport and transfer to Ruhengeri in the northern province of Rwanda as you enjoy the scenic views of the green countryside in the land of a thousand hills! Dinner and overnight stay at Le Bambou Gorilla Lodge. Wake up to an early breakfast and depart with your lunch packs to the park headquarters for briefing about the dos and don’ts of Gorilla trekking. Later head into the bamboo slopes and hills of Volcanoes National park in search of the gentle giants. 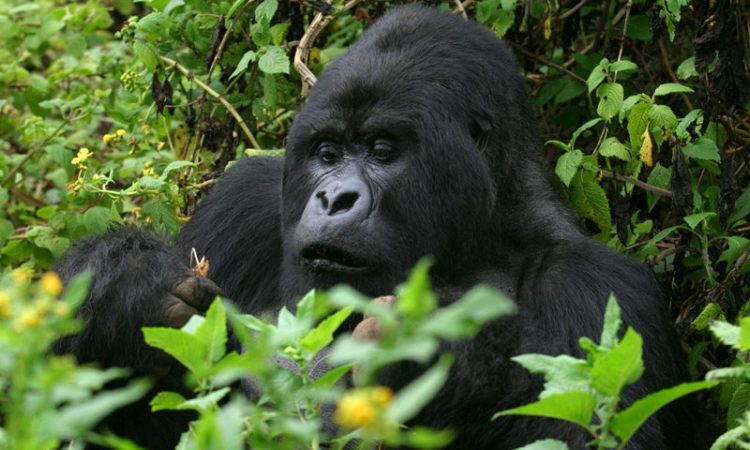 Gorilla trekking can take between 2 to 6 hours in Rwanda depending on the movement of the gorillas. On finding them, you will be allowed up to a maximum of 1 hour to view and photograph the gorillas as they go about their jungle business not minding who is watching! After the trek, return to the starting point or another point of assembly where you will be awarded your certificate. Meet your guide and transfer back to the hotel. If you finish the gorilla trek early and still feel strong, you can opt for a village walk around Kinigi. Dinner and overnight as above. Enjoy breakfast and make your journey to Uganda with a visit to the twin lakes of Burera and Ruhondo. Cross over to Uganda via Cyanika boarder and reach Kisoro town well in time for lunch. Have lunch and later explore the beautiful Lake Mutanda and visit the little known – undiscovered Sagitwe hill; a hill with a “basket” inside it where you will get a 360 degrees view of Kisoro town, Lake Mutanda, the Virunga mountains and a distant view of Bunagana town in Congo! Proceed to the lodge for dinner and overnight at Bwindi Jungle view Lodge. Have an early morning breakfast and head to the park headquarters for briefing by the ranger guides before embarking on your gorilla trek. Head into the forest and trek until you find the gorillas. Gorilla trekking can take 2 to 8 hours depending on the movement of the gorillas. After finding the gorillas in Bwindi, you will be allowed only 1 hour and then return. Your driver / guide will drive you back to your hotel to relax and spend another night as above. Enjoy breakfast at leisure and transfer back to Kigali through Katuna boarder to enable you catch more sights in Uganda including Echuya forest reserve and stretches of Lake Bunyonyi along the drive! Enjoy a brief city tour of Kigali including Kimironko market, the genocide museum. Have lunch at the historical Hotel Mille Collin (where the movie Hotel Rwanda was shot) and drop-off at the airport for your flight back home.